At the outset of our trip we decided not to take Malaria prophylactics but chatting to someone who had lost 15kg in a recent three week bout in Mozambique got us re-thinking. 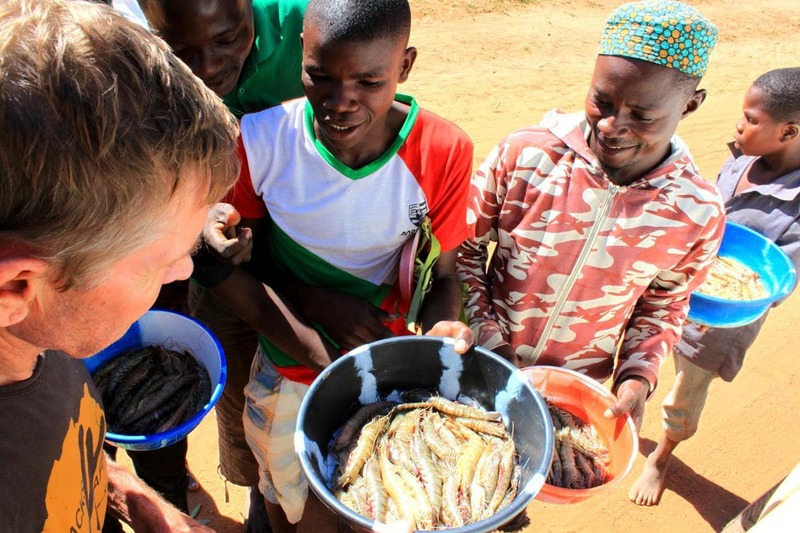 When we learned that some of Pete’s Zimbabwean family routinely take Deltaprim, we decided to do likewise as a bad bout of malaria would completely derail the trip. It’s a once weekly dose, very inexpensive and apparently effective against a high percentage of malarial attacks. On realising that Pete only had a short time before his 30 day Zimbabwean visa would expire, we decided not to cross at Mukumbura because of the uncertainty of obtaining a Mozambican visa there (he travels with a Australian passport) and instead hot footed it south from Chewore, heading for Nyamapanda. It was a slow drive out as the road, initially narrow gravel, was rough and, once on a hard surface, it was at times so badly potholed that the single lane of tar was used by pedestrians and vehicles drove on gravel tracks on both sides of that! The single lane tar strip in the middle of the road is used by pedestrians and cyclists. There is no direct route to the Nyamapanda border post but we enjoyed the hilly countryside, dotted with clay huts, and the twisting road through the Malingura Hills between Mushumbi Pools and Guruve. 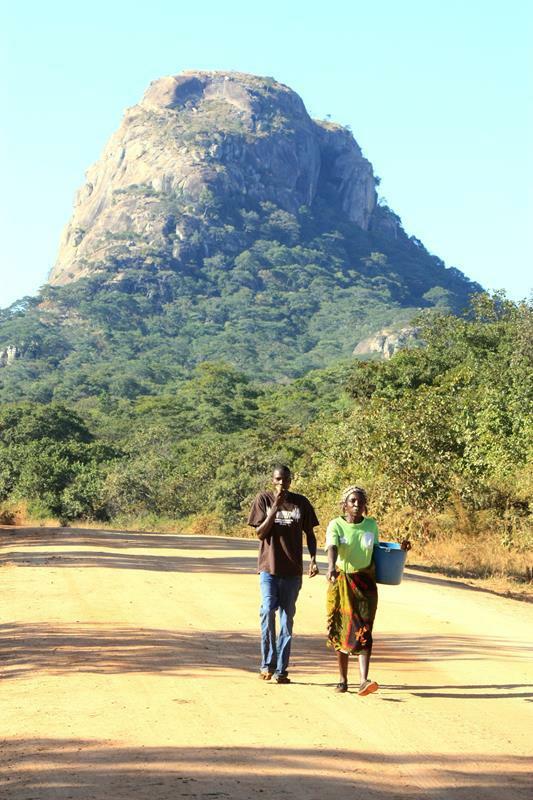 From there we encountered beautiful granite boulders similar to those at Matobo. One of the interesting dwalas. 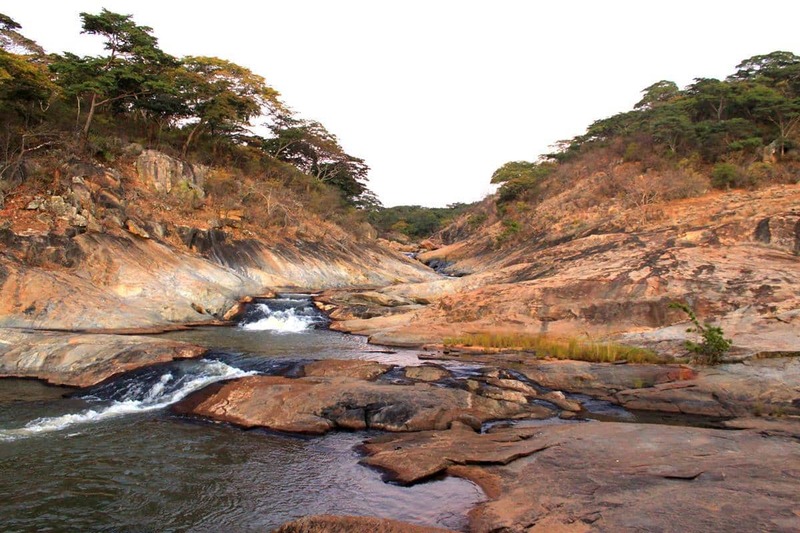 It was the first time that either of us had travelled through this beautiful part of Zimbabwe and the only available campsite within hundreds of kilometres was Paradise Pools, just south of Bindura, where we headed with some misgivings. Arriving near dusk we were amazed to find a beautiful spot near a series of pools, the river cascading down the granite slopes separating them. 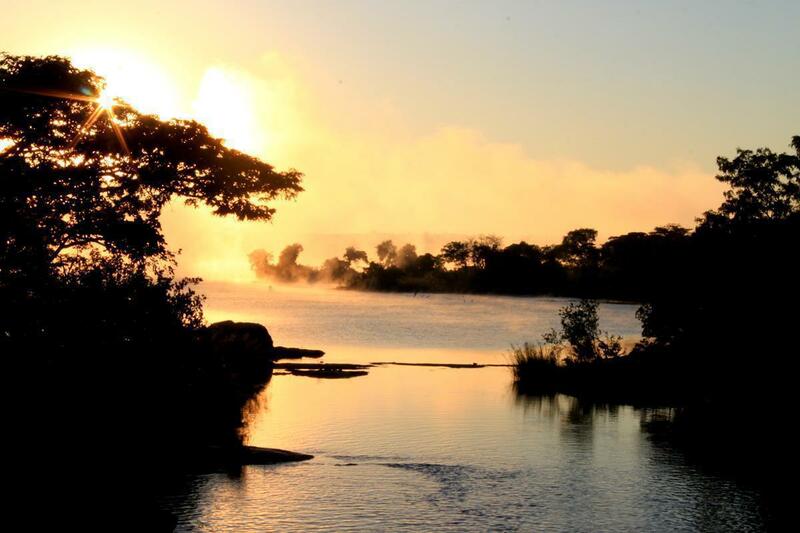 The Nyagui River flows into the Arcadia dam, creating swirling mist that hangs over the water in the early morning. Early morning mist over Arcadia dam. In all other respects it amounted to a bush camp with no facilities or water available as it has been allowed to go to ruin, but it was one of our camping highlights. Looking back we could not believe that we had spent almost a month in Zimbabwe! We encountered many police road blocks but we never once had any problems or were asked for a bribe. Our Shona greetings and smiles seemed to have worked wonders. Since converting to the US$ we both felt that Zimbabwe had become expensive, particularly for our biggest ticket item, fuel, at around R16.50 per litre. We entered the backwoods of Mozambique at Cuchamano and knowing it would be a long day, drove hard for the only lodging we could find on the GPS. This turned out to be decidedly grubby and the owner wouldn’t allow us to rent a room yet sleep in our rooftop tent; the alternative on offer in town was like a slum, so we drove on and bush camped off the gravel road leading east that had at last begun to take us in our desired direction. 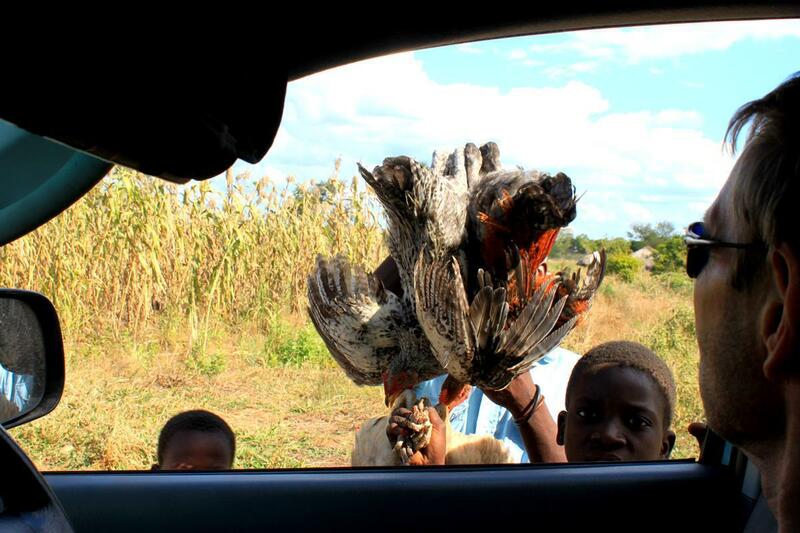 The children were very curious, but stayed at a safe distance, when we had breakfast next to the road. It was good to be back in Moz, but it was hard to find accommodation that suited us and also offered security for the vehicle. With the country so heavily inhabited and formal camping options very limited, it’s very difficult to find a secluded bush campsite. On the road we once again saw street vendors selling their produce; from fresh vegetables, honey, goat meat and live chickens to wood, charcoal and yellow containers of fuel. How fresh do you like your chicken for tonight? 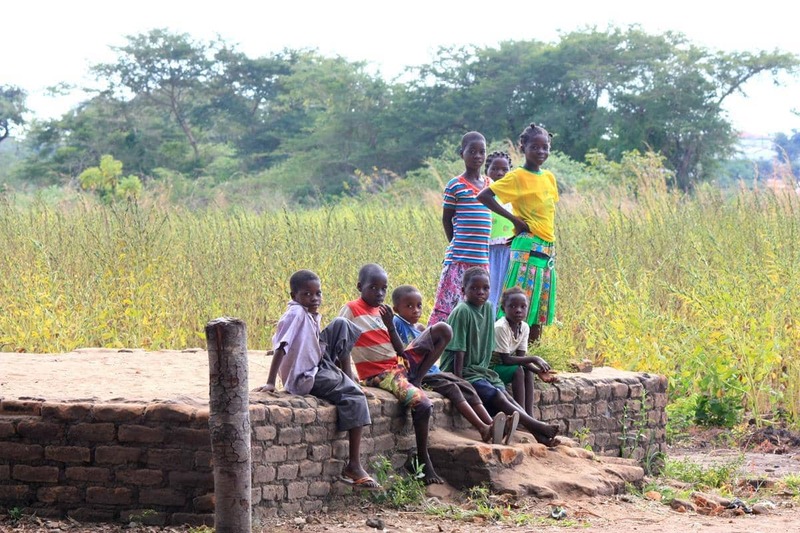 We crossed the long newly built bridge over the Zambezi near Caia and the landscape heading north-east was lush with a varied vegetation and red clay brick houses with thatched roofs. The new bridge over the Zambezi River at Caia. Eventually the badly potholed road improved but the remaining few kept us very alert. 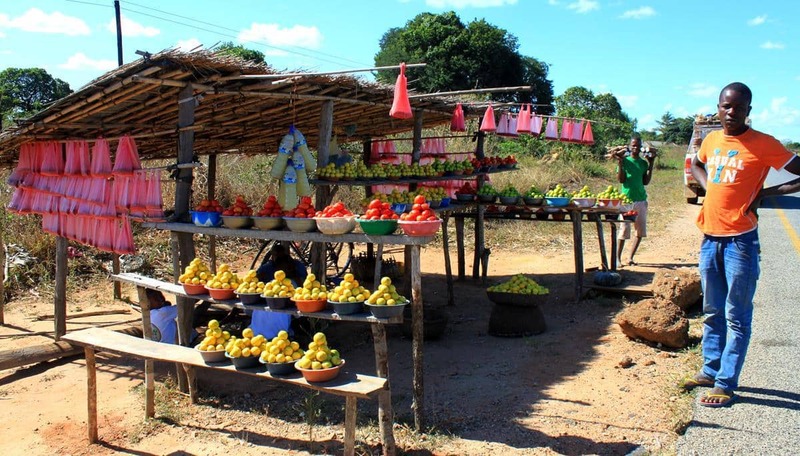 Small-scale farming was visible everywhere and once again it seemed that the local economy rested on the informal vendors selling their array of produce at the roadside, individually or in clusters, as the villages have virtually no formal shops. 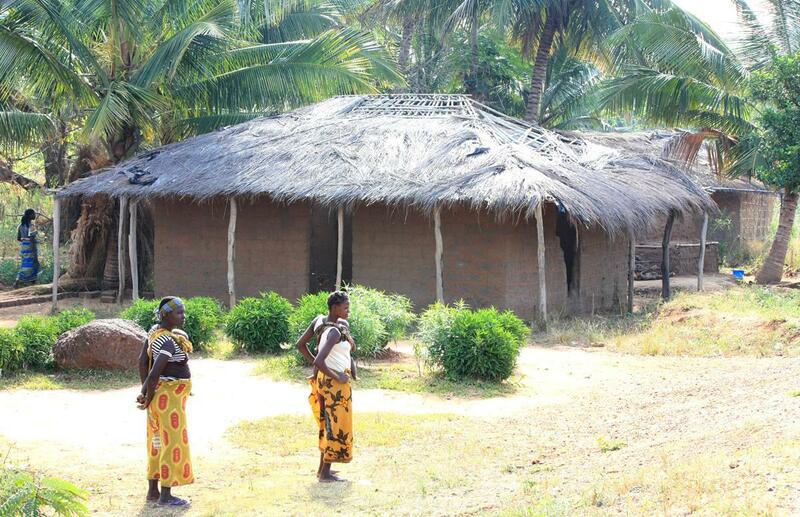 A typical village in the north of Mozambique. Mocubo was the first big town that we reached, its affluence clearly visible in the shops and buildings as well as the presence of motorbike taxis. 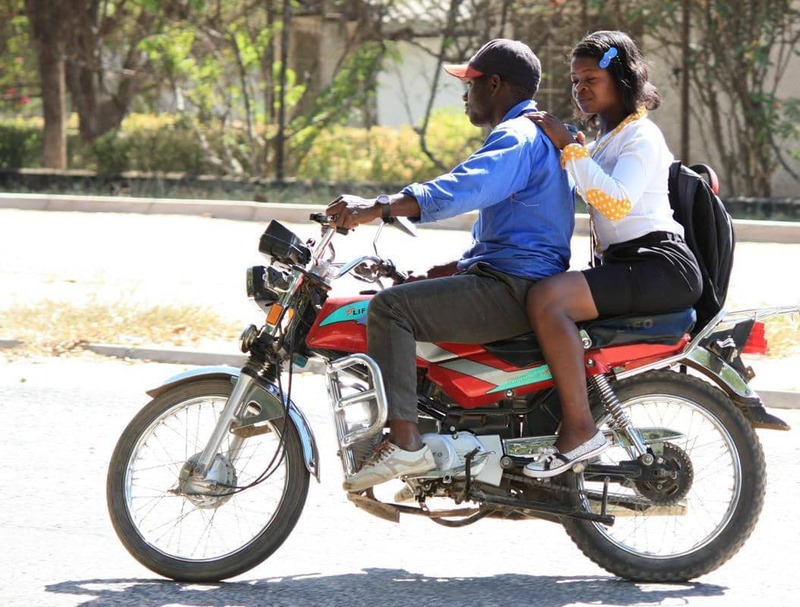 We even saw neatly dressed women riding their own motorcycles. 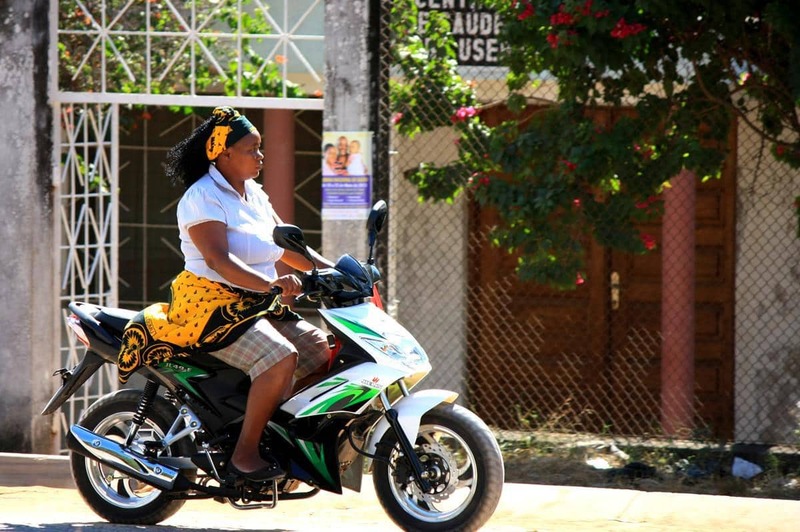 Neatly dressed women drive their own motorbikes in Mocuba. After another long day’s drive we arrived after dark at Complexo Montes Nairuca near Nampula. We were surprised and grateful to find such a super campsite nestling on a lake between some massive dwalas (granite rocks) which are also typical of this area. Beautiful dwalas dominate the landscape. The roads are lined with clay houses with thatched roofs. 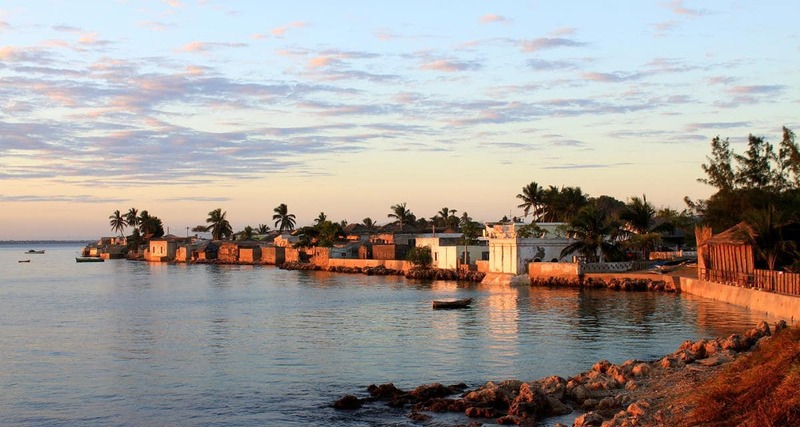 Next morning, after shopping and banking in Nampula, we headed for the world heritage site and the country’s original capital, Ilha de Mozambique. This is a small island 3,5km off the mainland, accessed by a single lane bridge, with pull over points to make way for oncoming traffic. Originally there were a number of Persian trading houses present here, it formerly being a hub for mineral, spice and slave trade with the interior. 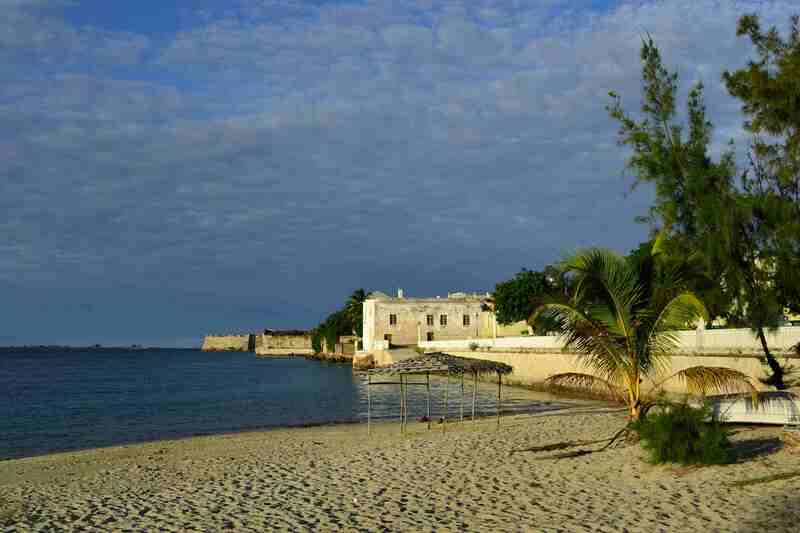 Ilha da Mozambique is a historical island. A visit to the island is an interesting experience and when driving off the bridge one is greeted by an enormous wild fig tree, with hundreds of long brown tendrils reaching for the ground. 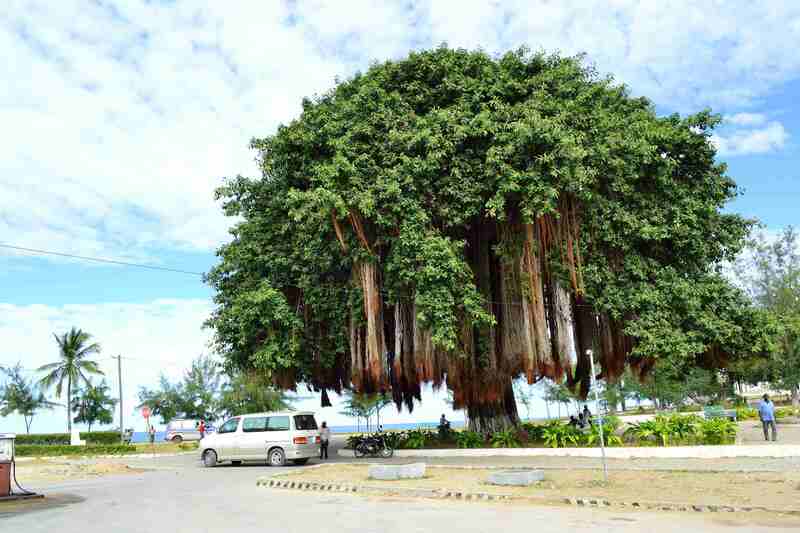 An enormous wild fig tree welcomes one to Ilha da Mozambique. 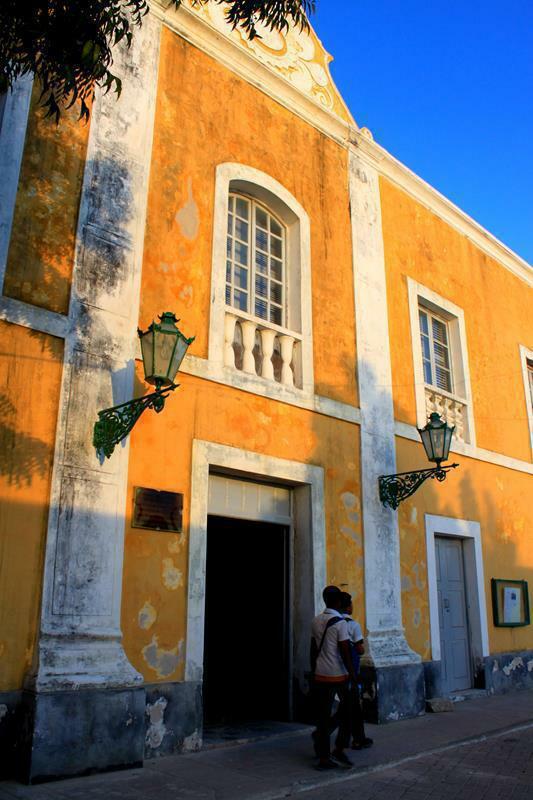 On the one hand the island offers the substantial remnants of Portuguese colonial architecture which has mostly been allowed to degrade completely. 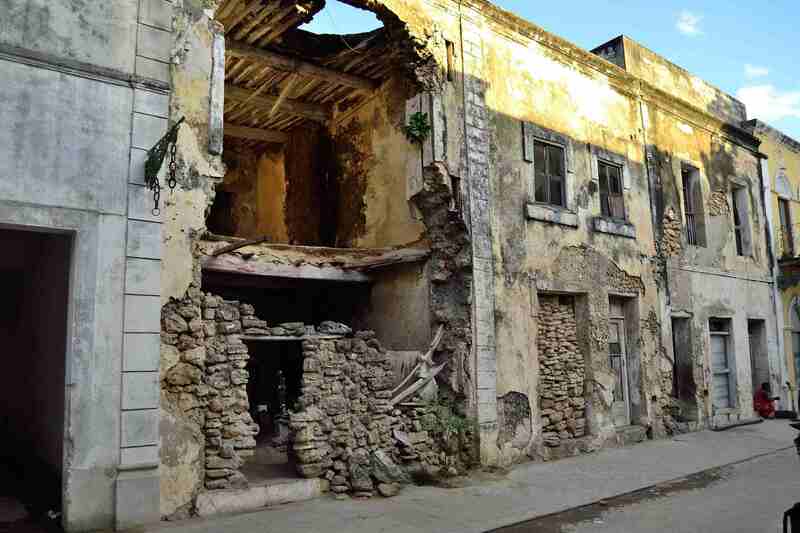 Most of the Portuguese architecture was left to go to ruins. On the other it’s a crowded, vibrant noisy place, with squalid shacks clustered together below the raised roadways and many boisterous youngsters out on the streets. Fishing must be an important part of the economy as many small fishing boats lie at anchor, drying out on the slopes of the sandy bays when the tide drops. 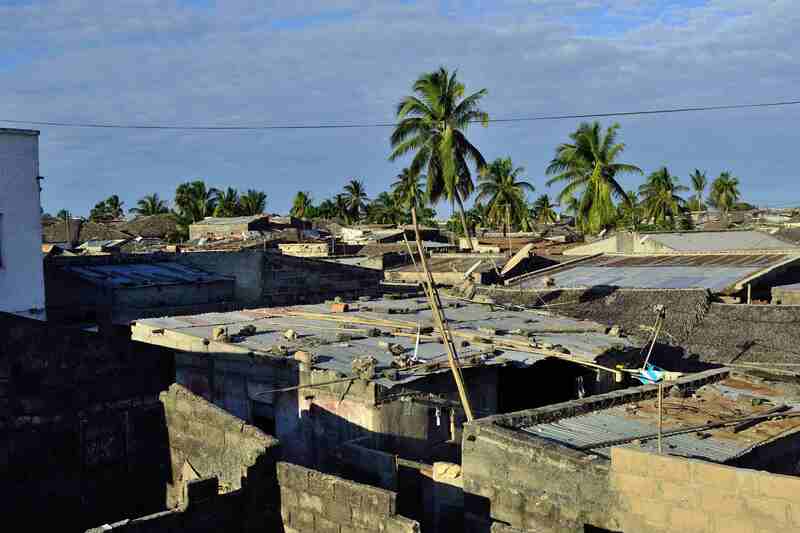 The island is overpopulated with people living in squalid shacks. Contrary to most places we had been to, we found that there appeared to be at best an indifferent or even resentful reaction to our presence. There is much to photograph, but the emergence of a camera for even general shots, sometimes brought a sullen stare or more negative gestures. The tar ring road around this small island is in reasonable condition but the smaller, dusty inner streets are potholed gravel. The island has a mixture of beautiful spots like this and poverty. We stayed at Cassuarina, a charming campsite right on the beach opposite the island and enjoyed the full moon rising over the bridge. 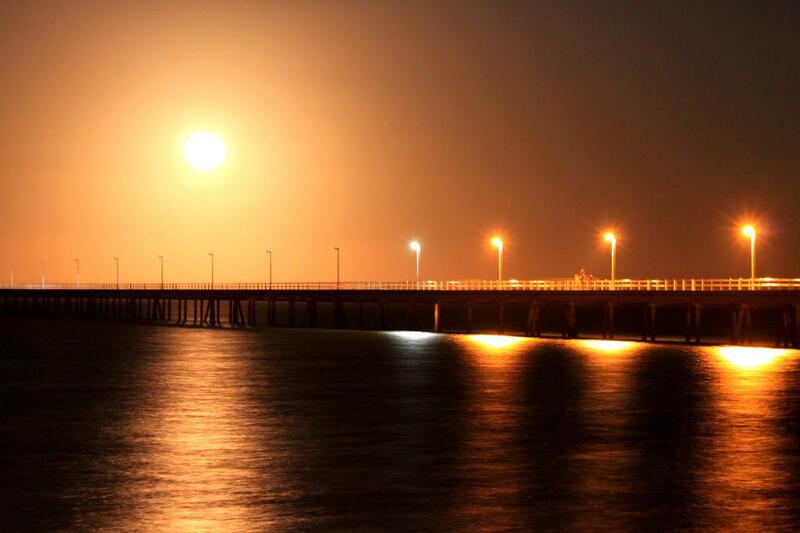 The full moon rising over the bridge. Buying fish from the local fishermen at Casuarina. 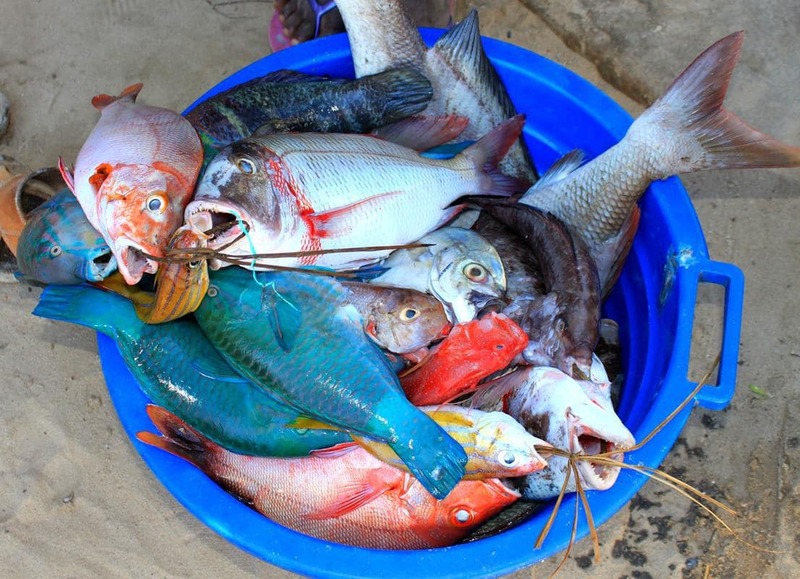 A wide variety of colourful fish to choose from. We decided to take the road less travelled to Nacala and stopped at a pictueresque spot, Carrusca Mar & Sol at Chocas, for a icy cold beer shandy. An idyllic setting at Chocas. Buying fresh prawns next to the road. 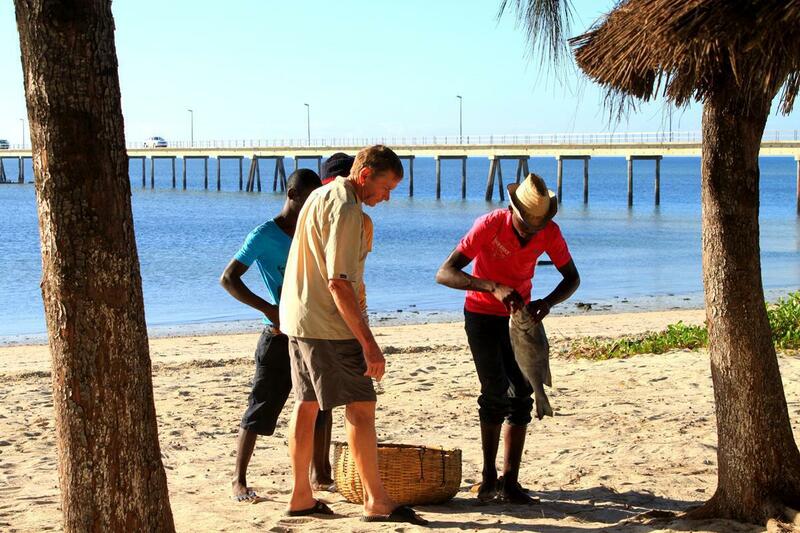 We only reached Nacala in the late afternoon (the sun sets shortly after 17:00). Upon learning from our first enquiry that there was no camping option in the entire area we resolved to enquire at every lodging place, as the teeming local population ruled out the possibility of a bush camp. We were lucky at our second stop and Shaquila Lodge kindly allowed us to camp on their lawn and made a bathroom available to us. Apparently some missionaries had been assaulted and robbed when they bush camped across the bay the previous week. Put off by this we moved on, which was a pity in a sense as a friend of ours had a good diving experience in Nacala a few years ago. We had hoped to drive up the shorter coastal gravel roads instead of making the five hour inland journey to Pemba via the tarred route. 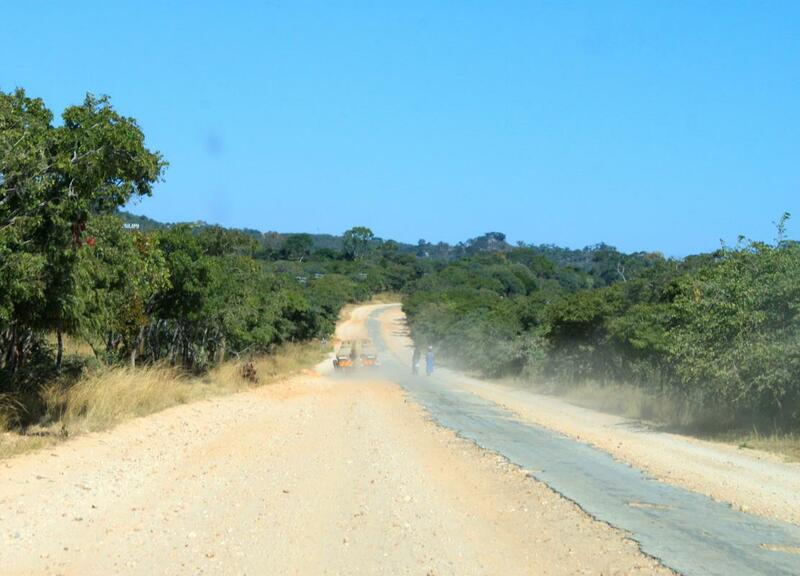 However, according to local information the final river crossing south of Pemba was impassable. 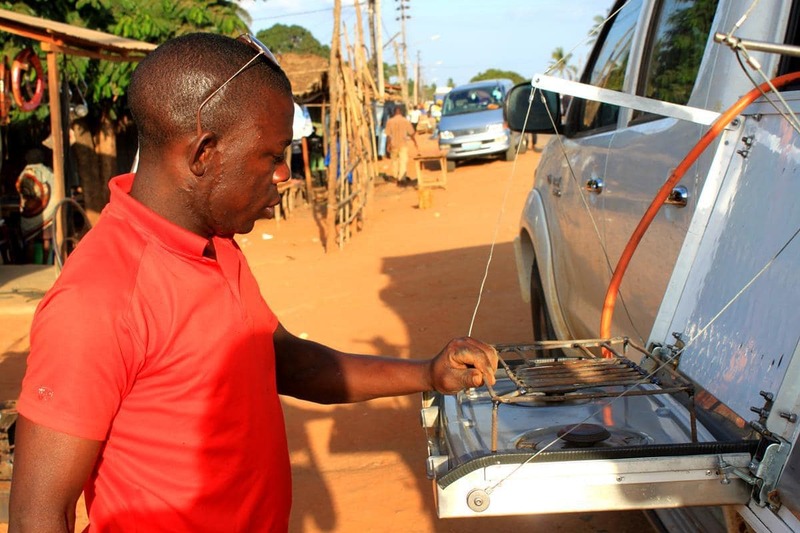 Later that afternoon we stopped at an informal steel welding shop at the side of the road to ask about a replacement grid for our gas stove which we had lost when the kitchen unit door popped open while we were driving. Getting a new grid made for our gas stove. Half an hour later we drove off with an effective replacement and an interesting lesson on how steel work is done with virtually no facilities. With darkness now approaching and uncertain about speed zones because of the lack of signs, we may have been exceeding the limit when flagged down by two traffic policemen, one wielding a radar device. They accused us of speeding and asked for our documents but never showed us a reading on the ‘gun’. Pete figured they were taking a chance and played completely dumb repeatedly saying that he couldn’t speak Portuguese (true) and didn’t understand (not entirely true). He engaged them politely in English which got them shaking their heads, then we tried French to more head shaking and finally Afrikaans. Then there was the mention of a fine, witch met with headshakes from us. Finally, exasperated, the officer returned our documents, told us to reduce ‘velocidada’ in built up areas and waved us on. We were grateful to arrive at Russell’s Place on the outskirts of Pemba after dark and settle in, to the shouts of avid Super Rugby fans watching the Saturday DSTV game on the big screen. Digital technology is cheap and pervasive; that night the thump of a luckily more distant disco ended after sunrise! 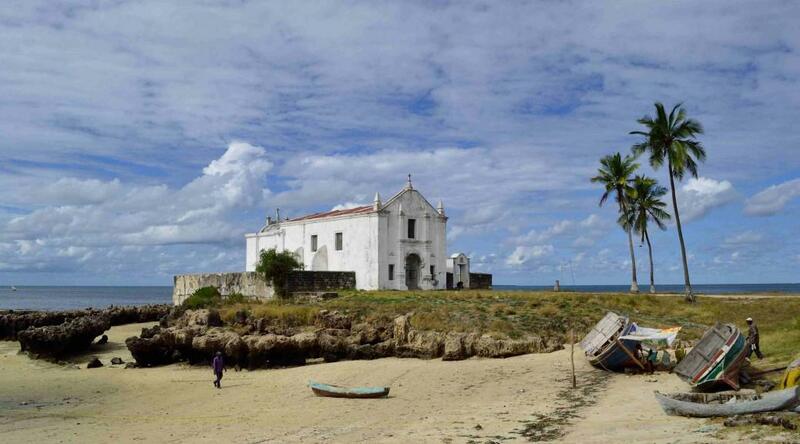 We intend spending the next week exploring the coast of far northern Mozambique. We would like to thank all those of you who are following our trip and have commented on the blog thus far. It is good to know there are people out there who are enjoying the trip with us. 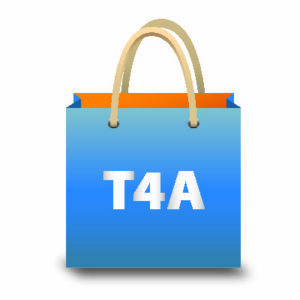 We try to reply to each comment by email; please forgive us if comms don’t allow us to respond immediately. Your articles, photos, writing, and trip is one of the best I have followed. Can’t wait for your next post. I enjoy your informative blog and beautiful photos, planning to do a Moz/Tanzania/Malawi trip soon (was even considering to go all the way to Ethiopia, but next time) so will follow you with interest. How far do you plan to go? Continuing to enjoy your blog. What a fantastic experience, also commenting same with Rusty and Elizabeth. Have a safe continuation of your journey. Awesome. Been there so I know exactly. Njoy and great pics btw! Don’t know how thw hell you guys going to settle back into civilisation again! What are the turquoise fish in the bowl? Did you eat one? 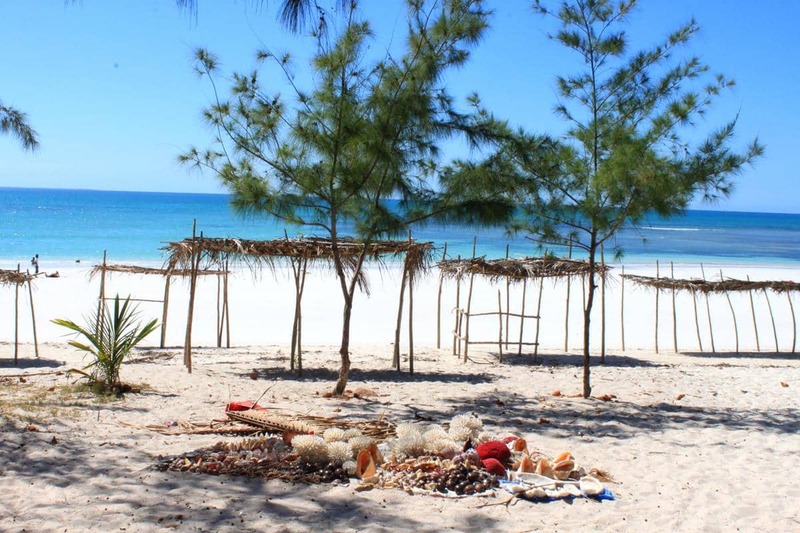 The pictures bring back fond memories of our trips to Mozambique , no where quite like it . Looks like you are still having fun . All the best Roger and Lorraine . Best wishes to you both. Barrie..